The emblem of the Canadian Forces topped by a St. Edward's Crown to indicate from where the military's authority stems. The Canadian Forces (CF) (French: Forces Canadiennes; FC), officially the Canadian Armed Forces (French: Forces armées canadiennes), are the unified armed forces of Canada, as constituted by the National Defence Act, which states: "The Canadian Forces are the armed forces of Her Majesty raised by Canada and consist of one Service called the Canadian Armed Forces." This single institution consists of the sea, land, and air environmental commands called the: Royal Canadian Navy (RCN), Canadian Army, and Royal Canadian Air Force (RCAF), which together are overseen by the Armed Forces Council, chaired by the Chief of the Defence Staff. At the pinnacle of the command structure is the Commander-in-Chief, who is the reigning Canadian monarch, Elizabeth II, represented by the governor general. Prior to Confederation in 1867, residents of the colonies in what is now Canada served as regular members of French and British forces and in local militia groups. The latter aided in the defence of their respective territories against attacks by other European powers, Aboriginal peoples, and later American forces during the American Revolution and War of 1812, as well as in the Fenian raids and North-West Rebellion. Consequently, the lineages of some Canadian army units stretch back to the early 19th century, when militia units were formed to assist in the defence of British North America against invasion by the United States. The current iteration of the Canadian Forces dates from 1 February 1968, when the Royal Canadian Navy, Canadian Army, and Royal Canadian Air Force were merged into a unified structure. Its roots, however, lie in colonial militia groups that served alongside garrisons of the French and British armies and navies; a structure that remained in place until the early 20th century. Thereafter, a distinctly Canadian army and navy was established, followed by an air force, that, because of the constitutional arrangements at the time, remained effectively under the control of the British government until Canada gained legislative independence from the United Kingdom in 1931, partly due to the performance and sacrifice of the Canadian Corps in the First World War. The Canadian forces were then heavily involved in the Second World War (which, as with the previous world war, involved conscription) and Korean War, and, from the 1950s on, actively worked with her NATO Allies to counter the threats of the Cold War. Land Forces during this period also deployed in support of peacekeeping operations within United Nations sanctioned conflicts. The nature of the Canadian Forces has continued to evolve. They are currently engaged in Afghanistan, under the NATO-led United Nations International Security Assistance Force, at the request of the Government of Afghanistan. Fort Edward is a National Historic Site of Canada in Windsor, Nova Scotia, Canada (formerly known as Pisiguit) and was built during Father Le Loutre's War. The British built the fort to help prevent the Acadian Exodus from the region. The Fort is most famous for the role it played both in the Expulsion of the Acadians (1755) and in protecting Halifax, Nova Scotia from a land assault in the American Revolution. While much of Fort Edward, including the officers quarters (burned down 1922) and barracks, has been destroyed, the blockhouse that remains is the oldest in North America. A cairn was later added to the site. During World War I, it was utilized as a training depot for Canadian and British soldiers. The site became known locally (but not officially) as "Camp Fort Edward" for the duration of the war. Among the recruits passing through the camp was the ill-fated Hollywood film director William Desmond Taylor. The fort was designated a National Historic Site in 1920. The blockhouse was additionally designated a Classified Federal Heritage Building in 1994. The Invasion of Canada in 1775 was the first major military initiative by the newly-formed Continental Army during the American Revolutionary War. The objective of the campaign was to gain military control of the British Province of Quebec, and convince the French-speaking Canadiens to join the revolution on the side of the Thirteen Colonies. One expedition left Fort Ticonderoga under Richard Montgomery, besieged and captured Fort St. Johns, and very nearly captured British General Guy Carleton when taking Montreal. The other expedition left Cambridge, Massachusetts under Benedict Arnold, and traveled with great difficulty through the wilderness of Maine to Quebec City. 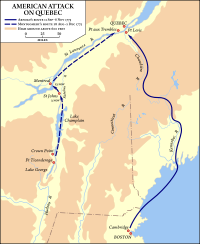 The two forces joined there, but were defeated at the Battle of Quebec in December 1775.Montgomery's expedition set out from Fort Ticonderoga in late August, and began besieging Fort St. Johns, the main defensive point south of Montreal, in mid-September. After the fort was captured in November, Carleton abandoned Montreal, fleeing to Quebec City, and Montgomery took control of the city before heading for Quebec with an army much reduced in size by expiring enlistments. There he joined Arnold, who had left Cambridge in early September on an arduous trek through the wilderness that left his surviving troops starving and lacking in many supplies and equipment. ...that in 1916, Berlin, Ontario changed its name to Kitchener due to World War I-era anti-German sentiment? Royal Canadian Air Force Second World War recruiting poster. HMCS Montréal, is a Halifax-class frigate that has served since 1993.